This stylish, spacious house has a large private roof terrace with sofas, loungers and an outdoor kitchenette. The air-conditioned apartment has attractive décor with minimalist, whitewashed walls and modern furniture. It has 2 triple rooms, 3 twin rooms and a double room, all of which have an outer window or a private balcony. In the entrance hall there is an arched ceiling and a foot spa. Also on the ground floor you can find a dining room, a private patio and a lounge with a flat-screen TV and DVD player. Free WiFi is included. There are many great restaurants within just 100 metres of La Casita del Mar. Located 550 metres away, Sitges Train Station offers connections to central Barcelona which take around 45 minutes. These large Group Accommodation properties are suitable for Large Occasions like Weddings or Wedding Anniversary Celebrations, Reunions etc. in Spain at Sitges on the Sunny Costa Brava Spain. Large Villas. New! 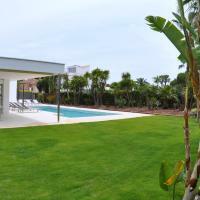 Group Accommodation Sitges Large Villas Sitges. Villa Nautilus is a detached villa with a terrace, situated in Sitges in the Catalonia Region. 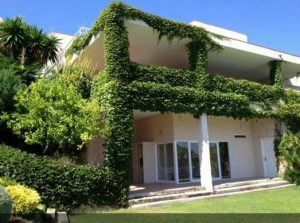 The villa is 1.6 km from Sitges Convention Bureau. Free WiFi is featured and free private parking is available on site. The unit is equipped with a kitchen. A flat-screen TV is offered. Other facilities at Villa Nautilus include an outdoor pool. The nearest airport is Barcelona El Prat Airport, 25 km from Villa Nautilus. Ibiza style pool villa in Sitges. Featuring a bath, private bathrooms also come with a bath or shower and a hairdryer. You can enjoy sea view and mountain view from all the rooms. At Ibiza style pool villa in Sitges. you will find a garden, barbecue facilities and a terrace. The property offers free parking. If you feel like visiting the surroundings, check out Sitges Train Station (1.9 km). This holiday home is 22 km from Barcelona El Prat Airport. Located in Sitges, Casa Cielo by HelloApartments offers an outdoor pool. The property is 1.6 km from Sitges Train Station. Accommodation will provide you with air conditioning, a balcony and a terrace. There is a full kitchen with a dishwasher and a microwave. Featuring a shower, private bathrooms also come with a bath or shower and a hairdryer. You can enjoy pool view and garden view. At Casa Cielo by HelloApartments you will find a garden, barbecue facilities and a terrace. Other facilities like a children’s playground are offered. Barcelona El Prat Airport is located 24 km away. Featuring a private pool, Luxury Beach House is a detached villa situated in Sitges. The property is 1.6 km from the Convention Bureau and features views of the pool. Free WiFi is provided throughout the property. The kitchen features a dishwasher, an oven and a microwave, as well as a coffee machine. Towels and bed linen are featured in this villa. Other facilities at Luxury Beach House include an outdoor pool. Free use of bicycles is available at the property and the area is popular for cycling. Luxury Beach House provides free private parking available on site, and Barcelona El Prat is 25 km away. Reus Airport is 54 km from the property. Luxury Beach House has been welcoming Booking.com guests since 9 Aug 2016. Group Accommodation suitable for Large parties OR Extended Families for Large Occasions like Weddings or Wedding Anniversary Celebrations, Reunions etc. in Spain at Sitges on the Sunny Costa Brava Spain at Sitges Costa Brava in Spain. Take A Break Holidays takeabreakholidays. 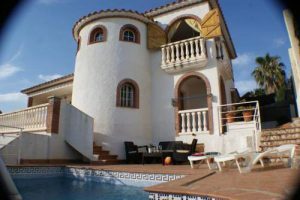 Large Villas Sitges Accommodation.